Oxygenating ponds for a cleaner aquatic environment promotes healthier fish and aquatic plant life. The new deep water air pumps offer high volume with steady air flow. Energy efficient, quiet operation. Single outlet discharge.12.25" x 8.5" x 8.75" 6' cord. 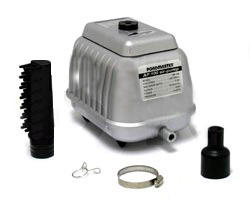 Suitable for ponds up to 10,000 gallons. 9150 cu.in/min. air volume 100 watts. Includes 7.25 plastic air diffuser with 33 air outlets. (3/4" ID air tubing not included) Max water depth 11'6" Pressure +6.53 psi. Rated at 45db. Stock photo of replacment difusser. Size and color will vary by model.